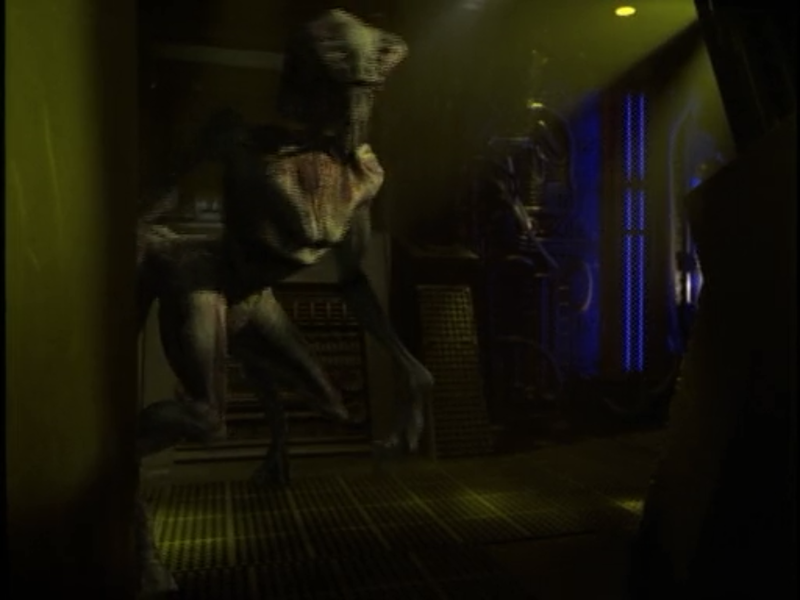 The Stargate universe doesn’t actually have that many really alien species. There are the standard gray aliens in the Asgard, and the lizard-like Unas, but almost every other race is human, derived from humans, or uses humans as hosts. The Re’Tu are one of the exceptions. They’re insectoid in appearance, and have a peaceful temperament in general, but the Goa’uld see them as a threat and have taken to wiping them out. The remaining Re’tu try to fight back, falling into two factions. 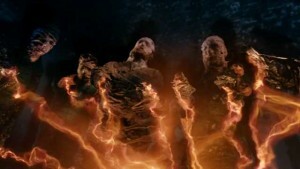 The only problem is… one faction’s means of fighting back was to exterminate their main source of hosts, and that’s us. The other faction basically synthesizes a human boy from scratch just to deliver a message, because that’s the only way they can possibly communicate with us. If there were an award for “one-off enemy that gets repeatedly brought up,” it would go to the Re’tu. Their primary trait is that they’re effectively invisible to human eyes, and by extension, the Goa’uld. What that meant for the show is that basically any time anything happened that they didn’t have an explanation for, the Re’tu were suggested as a possible cause. Of course, they never were; their only appearance is in “Show and Tell,” a second season episode. But it just goes to show–the SGC never forgets. The brief glimpse before they assume a more human appearance. Most people, if choosing for this list from Voyager enemies, would probably go with Species 8472. They’re definitely weird, and fluidic space… well, that’s beyond weird as far as environments go. But they’re still physical beings, and they begin to communicate as time goes on, and Voyager is able to strike a deal with them. There’s another alien race, though, who are strange enough that we barely even glimpse their true form. The Photonic Lifeforms, as the only name we know them by, were peaceful explorers much like Starfleet, except their kind exist in a “trans-dimensional realm” and had no idea the physical universe even existed. As they appear in “Bride of Chaotica!” they mistake Voyager‘s holodeck for a new world, and end up trapped in this crazy 1950’s-style holoprogram. They are only able to interact with Voyager‘s crew by, essentially, “possessing” holodeck characters, and still couldn’t be convinced that these completely incomprehensible physical beings were as real as they were. 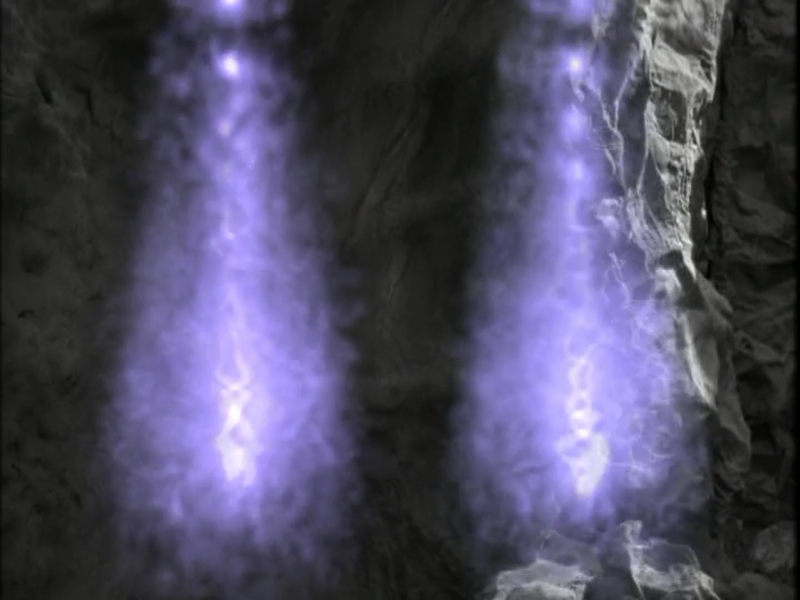 The episode itself is really fun, if you ask me, but the idea of the photonic lifeforms is a pretty out there one. You can’t get much more different than beings that effectively interact with a completely different universe than the one we do. Do they have any kind of parallel to biological functions? Do they need a ship? It’s a mystery. Also it utterly dwarfs the Enterprise-D and was capable of outrunning it. So we’ve got strange physical beings, and bizarre noncorporeal beings. There’s another type of alien that pops up when you need something truly rare, however: the “cosmozoan,” spaceborne creatures that live in the vacuum itself. 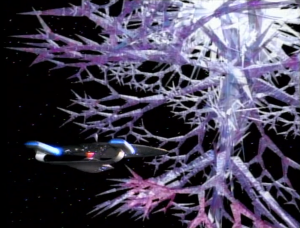 The most notable of these in the Trek universe is The Crystalline Entity, a complex, snowflake-like alien made of some unknown crystal substance. It devoured the energy on numerous worlds, killing everything from human to grass and making it so that nothing could live there for years afterwards. The Crystalline Entity is one of the only living creatures capable of traveling at warp without need for a starship or warp drive. And beyond that, it’s intelligent, as proved with its communications to Lore and the Enterprise‘s fledgling attempts shortly before its demise. The Crystalline Entity didn’t seem to have any malice in its actions; it simply fed off the energies present on life-bearing planets, which basically meant we were its prey. It’s possible that had the Enterprise been able to figure out a means of reliably communicating with it, the Entity might have been willing to adjust its behavior, but there’s no way to know. It seems like stars would be a better source of power for these kinds of creatures anyway, so the Crystalline Entity will always remain a mystery. they never really figure out that whole dimensional transitioning thing though. By far, the most unusual aliens to show up on TV are those that don’t even share the same geometries as us. For the noncorporeal, geometries are irrelevant, and both physical and spaceborne aliens are still 3-Dimensional. Not so with the Boneless, 2-D aliens that feed off of “dimensional energy” and appeared in “Flatline,” a story from Doctor Who‘s recent 8th series. They seemed to be intelligent to some degree, but refused the Doctor’s rudimentary attempts at communication and destroyed humans and other 3-D objects with impunity. Even the massive power of the TARDIS was dampened by their feeding, to the point where a boring old train could risk destroying it. Of course, 2-D lifeforms aren’t the only option here. This might include higher-dimensional beings as well, who would look on us the way we looked on the Boneless. That’s all for this week. Sorry it’s a little late. Are there any other unusual aliens you’d like to add to the list? Special mention to the runners-up, Farscape‘s Leviathans and Babylon 5‘s Thirdspace aliens. You can let me know of your ideas in the comments, or on Twitter @RetroPhaseShift. Look for the next Primer sometime next week! clever list. i didnt even think about moia until i saw your runners-up. With the way X-Files loves to keep things ambiguous it’s hard to say. Also pretty much everything there is specifically designed to be weird as hell so it’s almost like cheating, haha. I decided about halfway through the list that I’d try to pull one from each of those “categories” of alien life–physical beings, non-coroporeal beings, space-dwelling beings, and higher/lower-dimensional beings. I usually don’t like to pull 2 examples from the same universe but the sheer quantity of Trek out there makes it easier to find.